Mindy and I tried to crash course our French historical knowledge but budgeting just a week in Paris that July of '89, we were mostly interested in hitting the Left Bank, the major museums, the cafes. She was a shopper, I wanted to see where the expat gliterati hung out, drinking absinthe, back in the day. We hit the Gallerie Lafayette, Les Deux Magots, Shakespeare & Co. We climbed Notre Dame, took a boat ride along the Seine, saw the Eiffel Tower. We went to a bar where we bought our own drinks. I had a $9 beer; almost half of what I planned to spend on my hotel room. We took the metro to a famous Paris flea market where Mindy bought nothing but I spent $90 on a killer pair of black leather cowboy boots. I must have been out of my mind, I had to schlep those boots in my backpack all across Europe. As our week in Paris progressed, it was clear this Bastille Day celebration was a very big thing and we were glad, almost excited, that we were staying for le quatorze juillet and we'd be able to see the parade before taking the train down to the Cote d'Azur. It wasn't just any 14th of July, no ordinary Bastille Day. It was the 200th anniversary of the 1789 Storming of the Bastille. The fact that only a handful of prisoners (seven actually) were housed there—none of whom were political prisoners— and were freed from the dreaded Bastille that day isn't the point. Nor that Robespierre's Reign of Terror would follow shortly thereafter. This was the beginning of the French Revolution. 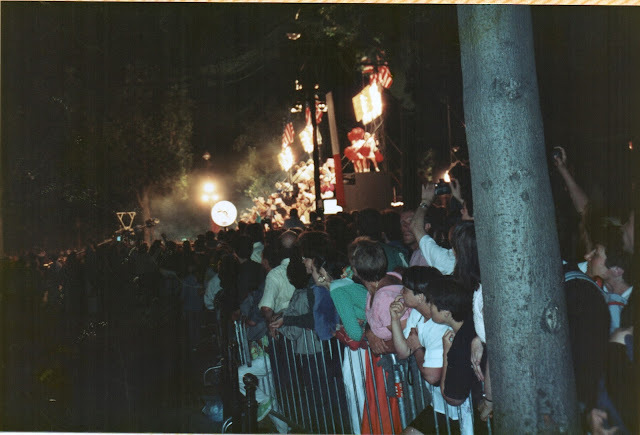 And that summer of 1989, the bicentennial of that event was a very big deal. Over a million people lined the Champs Elysees waiting to watch the parade that day. It felt like most of them were pressed behind the same barricade as Mindy and me. I couldn't do it today, my bladder would forbid it. 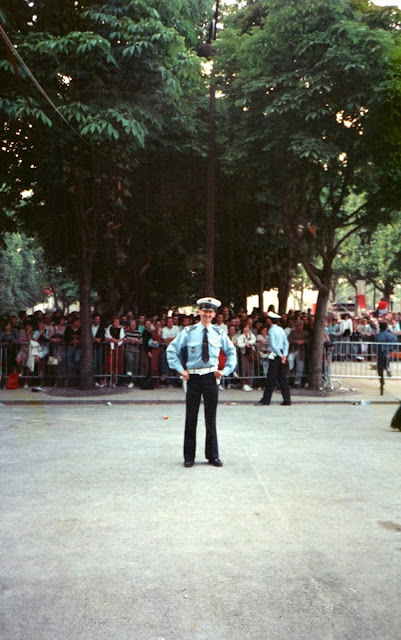 According to various news reports there were two parades: the first, in the morning, a military parade jam packed with French tanks and soldiers marching from the l’Arc de Triomphe to Place de la Concorde and a second parade, along the same route in the evening, a dazzling display, marching bands and spectacular floats from around the world. We finally found ourselves wedged into a spot about half a city block off the Champs Elysees, not too far from the presidential palace, somewhere between Boulevard Franklin Delano Roosevelt and Place de Concorde. To our left was a smaller ancillary street, possibly Place Clemenceau, barricaded off as well. We got as close to the edge as we possibly could. It was muggy hot—why do we travel so much in the muggy hot summer months?—made muggier and hotter by all the tourists and French families surrounding us. We passed the time checking out the gendarmes lining the roads. They were being inundated with "When is it going to start?" questions. As if they knew. But like the gendarme above, they were in good humor. There were lots of wisecracks about there being another revolution if the parade didn't start soon. The natives—and the tourists—were getting restless. Finally, the parade found its way to our place on the route and the people cheered. Later I would learn that a rather famous French graphic artist, Jean Paul Goude, designed the nighttime parade. 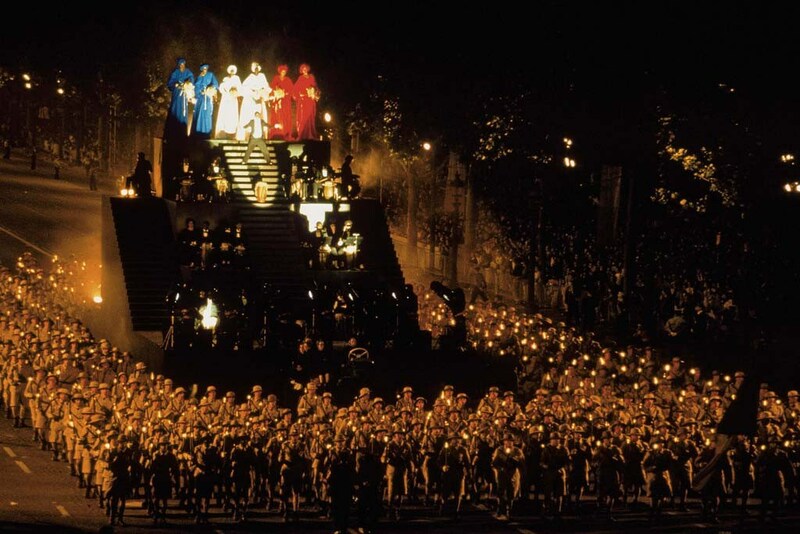 By all accounts it was spectacular, the contributions from countries around the world were show-stopping. A college marching band from the US proceeded backwards down the avenue doing the moonwalk in some sort of tribute to Michael Jackson, the Russian entry included falling snow and Brits marched in a manufactured rain. American opera star Jessye Norman capped off the parade, cloaked in the bleu, blanc et rouge singing the Marselleise. It sounds amazing. Whatever I saw—which was none of that— I saw from a distance, standing on tippy toes, as music pounded and floats passed by. 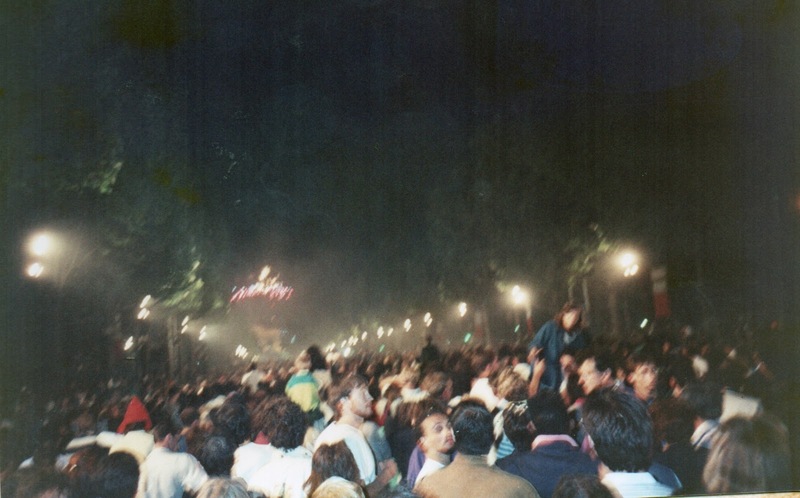 Afterwards, now fully dark, we joined the throngs of people walking up the Champs Elysees. We had no choice, we were carried along with the crowds. Unlike Joni Mitchell's Free Man in Paris, I didn't quite 'feel unfettered and alive.' Rather, I felt a mix of giddiness, claustrophobia and a nagging sense—the same nagging sense that crowds leaving a packed soccer stadium might have—that all this joy could lead to something terribly bad. The Champs Elysees and surrounding streets were closed to cars, instead masses of people took over the road. Starving, Mindy and I tried to find an open cafe but, like the streets, they were completely filled up. The official fireworks were being set off; a frantic celebratory spirit filled the air, growing increasingly wild as more and more spirits filled the gullets of the celebrants, small groups breaking spontaneously into la Marseillaise. Most of the metro stops seemed to be closed and in a continuation of the big show, people started tossing those tiny little fireworks into the street. I was stunned. A little more nervous. The atmosphere seemed so wild wild west to me. Where were all those gendarmes when you needed them? Then I was struck. A loud bang, too close to me, followed by a sharp sudden searing pain in my leg. Perhaps like a bee-sting, although I've never been stung, so I don't know. There was some blood, not much, but enough to get me to the nearest Croix Rouge tent where we could escape the madness of the streets for a bit. I've always been grateful for that, that the Croix Rouge was there. Not for the bandaging up of what amounted to little more than a flesh wound, I'm grateful because when I tell people I got struck by a firecracker at the Bicentennial of the French Revolution back in the summer of '89, I get to say Croix Rouge. I could just say the Red Cross, that's after all what it is, the French Red Cross but "Kr'Whah Roozh" has such a lovely sound, and feels so very French, I love being able to say it. It feels as good in the mouth as a piece of chocolate followed by a sip of red wine, a bite of baked brie, or a French kiss. Besides those black leather boots I picked up a the flea market, that tiny wound was my other major souvenir from Paris. It left a tiny mark, an almost invisible white line just below the calf on my right leg. Later on in that long trip, I stomped on a table in Munich, celebrating Oktoberfest, in those black cowboy boots. After years of not wearing them, I gave my killer boots away over a decade ago. I'll always have that tiny white scar. I'm hooking up with Paulita Kincer's Dreaming of France meme. Lots of Francophiles sharing travel tips, great pix and more. All photos by moi, except as noted. What a sweet scar of a memory & a lovely story to tell later. I have so enjoyed reading about your youthful adventures. What a great memory for detail you have. I've been going through boxes of old photographs, trying to get a bit more organized. Amazing how those memories come rushing back! You have some wonderful memories (and stories) to share and I am loving reading about your adventures! Aw! Thanks, you made my day!! I love this post more than I can say! It is overloaded with the joy, awe, curiosity, emotions that I know I would experience in that situation. What grand timing! Yes, we all have souvenirs of Paris -- yours might be a tad more lifelong than most of ours! So happy I stopped over here during Paris in July. So behind and catching up! Oh, WOW! You just touched me so much: I love this comment more than I can say. Thank you!